While the most remote destinations many of us can ever hope to reach are spots like Vanuatu or Indonesia’s Raja Ampat archipelago, those with loftier ambitions will be pleased to hear the prospect of commercial Moon landings has just taken a big step forward. 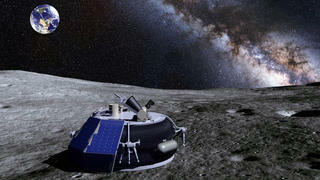 US-based spaceflight venture Moon Express has just been given approval by the American government to undertake the first Moon landing by a private commercial enterprise. The company’s lunar mission is slated for 2017 and is being carried out as part of Google’s Lunar XPRIZE competition – a $30 million contest aimed at incentivising entrepreneurs to create new methods of affordable access to the Moon and beyond. Of course, travelling into space is a costly business and Moon Express does not propose to land on the Moon simply for the fun of it. The recent discovery of water on the Moon means it could hold vital resources for the future of humanity and Moon Express intends to undertake significant experiments to determine exactly how these can be utilised back on Earth. Although commercial Moon landings for the general public are still a long way off, this landmark ruling does set a new precedent for private companies wishing to monetise opportunities outside the Earth’s orbit. Should the technology for everyday space flight ever become economically viable it may be just a matter of time before you can book yourself a ticket.